Delivering instant remote access is no longer just about remote employees. It's about enabling customers to perform online transactions, mobile sales reps to access ERP applications, outsourced call centers to share the customer database, and more. While ensuring reliable, instantaneous access is a must, so, too, is the need to guard against breaches and ensure continuous compliance. In this business environment, strong authentication-using multiple factors to ensure users are indeed who they claim to be-is vital. 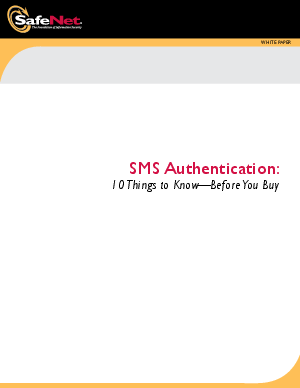 As they evaluate the alternatives, many organizations are opting to use SMS authentication, which offers a mix of convenience and security that make it ideally suited to many usage scenarios.